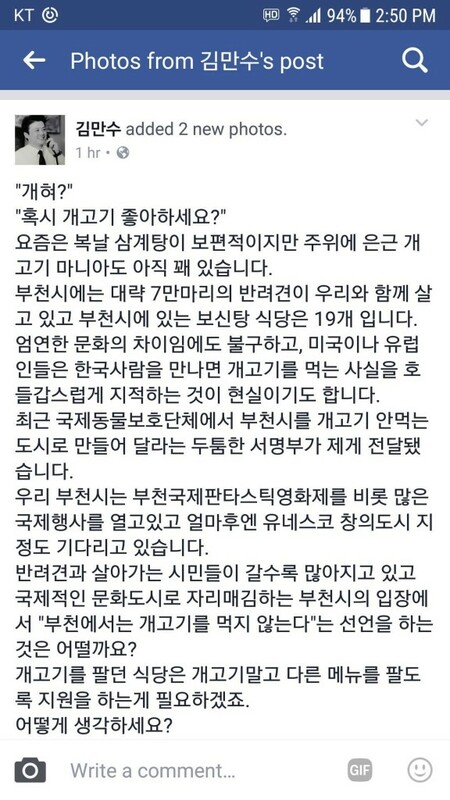 Home / Blog / Bucheon Mayor Kim Man-Soo publicly suggests that his city become dog meat-free. Click HERE to see the Mayor’s post and post a word of support for Mayor Kim to end the dog meat trade in his city. 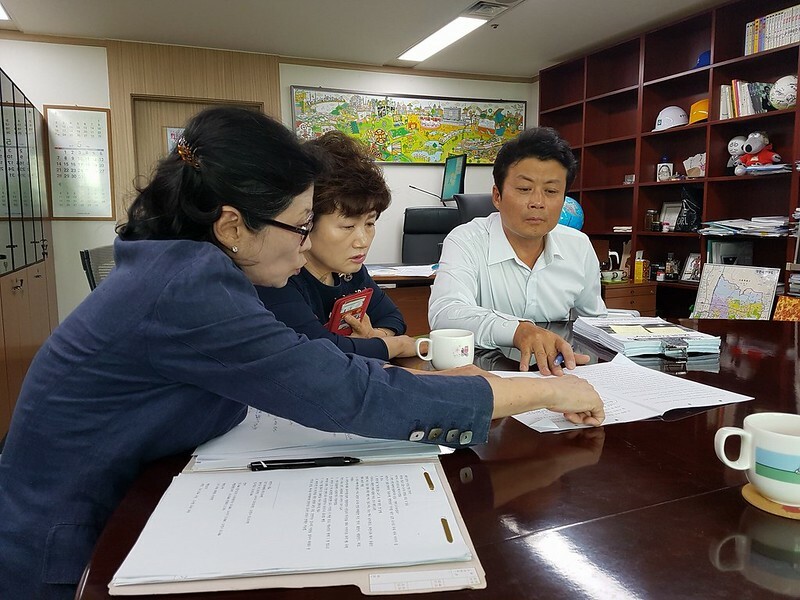 Nami Kim had personally delivered our online petition signatures to Mayor Kim Man-Soo two weeks ago, and had a lengthy meeting with him discussing this issue. 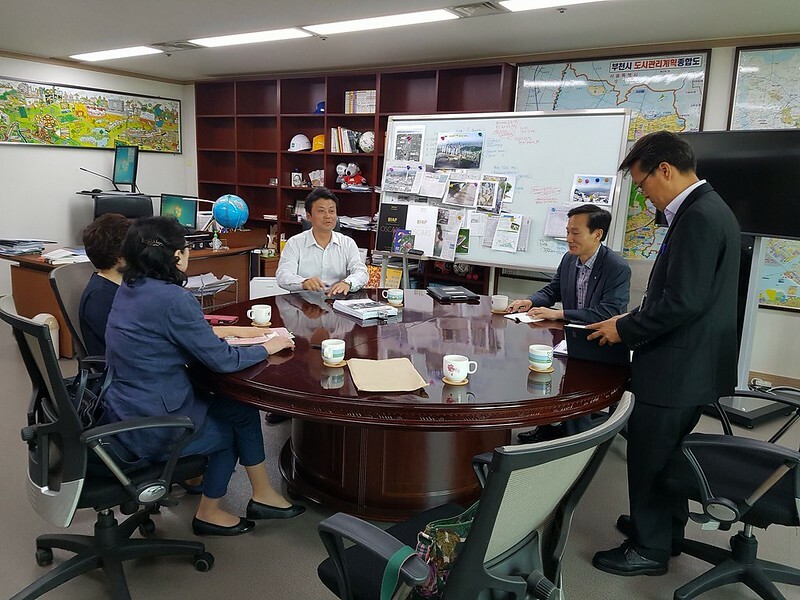 Photo: Nami Kim (SaveKoreanDogs.org)’s meeting with the Bucheon Mayor Kim Man-Soo and his staff on June 7, 2017. Below is Nami’s translation in English, of the mayor’s social media post . Eating chicken soup is more common these days but I still see dog meat maniacs. In the city of Bucheon, we have 70,000 pet dogs, and there are 19 dog meat restaurants. This comes from cultural differences, but Americans and Europeans point out this issue when they meet Koreans. 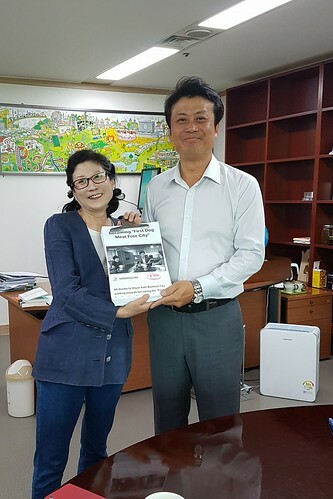 Recently, I received a box of petition signatures from the international animal rights activists and groups, asking our city to become a dog meat-free city. The city of Bucheon holds International Fantastic Film Festivals, and is now waiting to be designated as a “Creative City” by UNESCO. Our city is becoming more and more international, so why not we declare “Bucheon – no more dog meat”? Click HERE to see Nami Kim’s post. Thank you, Nami and your team for being on the ground and working tirelessly to save the Korean dogs from the horrendous dog meat industry. 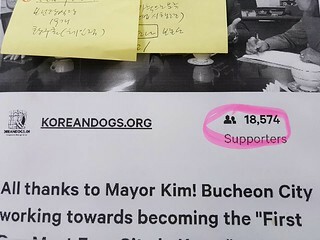 Our petition to the Mayor is to thank him for all his efforts to end the dog meat trade in his city so far, which is virtually unheard of in Korean cities and government. It is very important to encourage him to make Bucheon the first “Dog Meat-Free City” in Korea. We would like Mayor Kim to be the example for other mayors and governors. But We don’t even have 20,000 signatures. Please sign the petition and continue to share it to show your support for the Mayor to bring swift change to end the dog meat industry in his city. Click HERE to see post about the effort Bucheon is already making to end the dog meat trade from SaveKoreanDogs.org’s Facebook page. Click HERE to see previous posts about the effort Bucheon is already making to end the dog meat trade on our site. Photo: Nami Kim (SaveKoreanDogs.org). 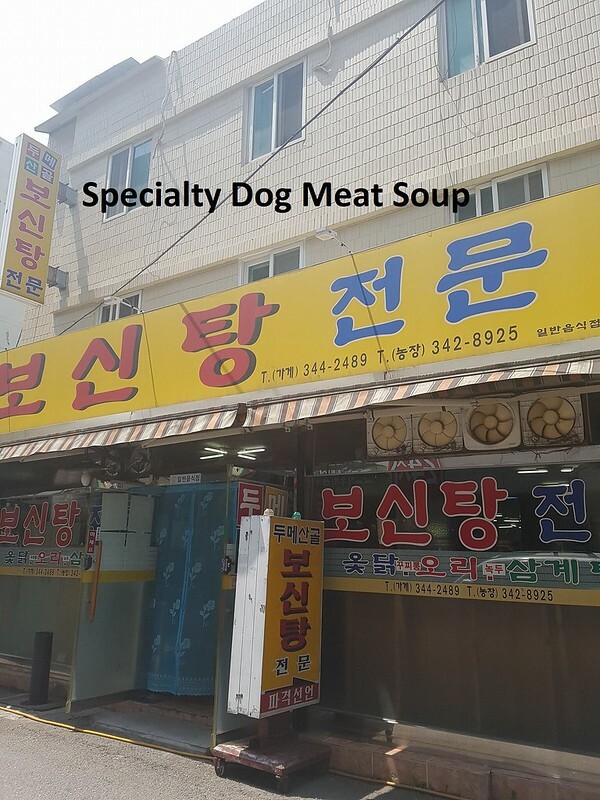 A dog meat restaurant in Bucheon. Thank you. Please, also include cats. Everyone needs to boycott cars, appliances, TV’s, watches, phones, etc. made in S. Korea! Dogs are raised to be tortured, killed and eaten! It is an abomination and illustrates how backward and cruel this country is! Don’t forget to boycott the 2018 Winter Olympics and any travel there for that matter! There is NEVER ANY EXCUSE for cruelty. Thank you Mayor Kim for your efforts to try to end this barbaric cruelty and for trying to bring your city into the 21st century. I wish you every success. Do it, Mayor Kim! Make Korea respectable again! I commend Nami Kim and Mayor Kim. Way to go guys! 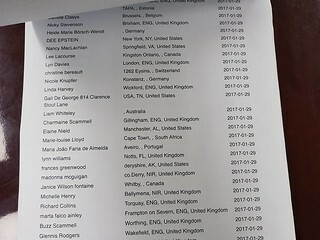 The world is watching! 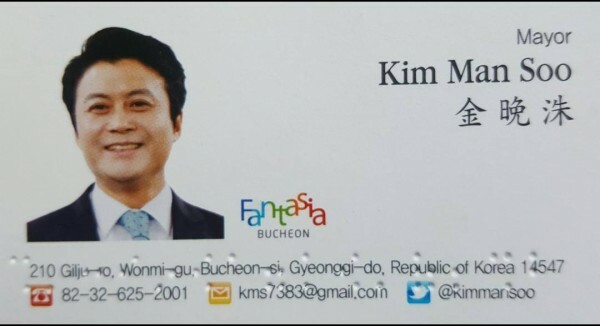 Mayor Kim, you are a real hero! You are a shining example of what a leader should be. You and Nami Kim have my heartfelt admiration.